PAUL FIX had a career consisting of a combination of 527 motion picture and television appearances. but most people wouldn't be able to put a face or role to his name. Let alone know that it was Fix who taught John Wayne that famous walk of his. However, if you were a fan of television's "The Rifleman". You knew the actor as "Marshal Micah Torrance", but that was 33 years after Paul Fix started acting. Paul Fix was born on March 13, 1901 in Dobbs Ferry, New York, on the lower East Hudson River, and parents were both German immigrants. His father was a brew master named Wilhelm Fix and his mother was Louise C. Walz. They gave him the name of Peter Paul Fix, but some sources say he was born Paul Fix Morrison. Information to this strange last name can be found on page 200 of James Robert Parish's 1978 book "Hollywood Character Actors". According to Fix's niece, Carolyn E. Fix, those writers actually mixed up her Uncle's name with the birth name of Paul's good friend and acting student John Wayne. The above photograph, as stated in the caption, is missing Paul Peter's oldest sister and unfortunately there is no date associated with it. His mother would die at the age of 54 when her son was 13 and Paul's father two years later at 62. The young boy first went to live with one of his married sisters in Yonkers, New York and then for some reason he was moved to his other sister in Zanesville, Ohio. During this period there was a change between his first and second names and Paul Peter Fix became Peter Paul Fix. Again I could not locate any reason for the switch. I also could not locate any information on the young man's education, but with the outbreak of World War One things did get a little interesting for him. Peter Paul Fix was a member of the New York National Guard located in Peekskill, New York. After three months in the guard he went AWOL and enlisted in the Army. Peter Paul went through boot camp and was assigned to Fort Slocum, New York on Davis Island. Three months later he went AWOL once more, and the day before his 17th birthday enlisted in the United States Navy. Fix served at Newport, Rhode Island and Charleston, South Carolina. Along with on the troop ship U.S.S. Mount Vernon as a hospital corpsman transporting troops to Europe. While stationed in Newport, Rhode Island. The young sailor was asked, if he would appear in a Navy Relief Show. He accepted one of the female roles of their version of Gilbert and Sullivan's operetta "H.M.S. Pinafore". This was apparently the first time Fix had ever acted and the show toured for six weeks between Providence, Rhode Island and Boston, Massachusetts. 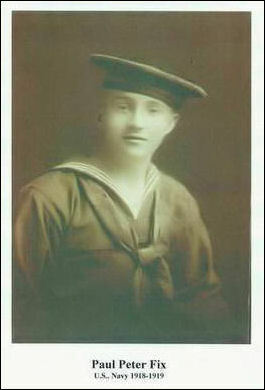 On September 5, 1919 Peter Paul Fix was Honorably Discharged from the United States Navy. In 1922 Paul and his girlfriend Frances "Taddy" Harvey were married. The newlyweds moved to Hollywood and the now Paul Fix became an actor and writer. Shortly afterwards the movie and Stage actress Pauline Fredrick saw Fix perform. He was hired along with a close friend named Clark Gable to be part of Fredrick's Touring Stage Company. Which traveled up and down the California coast performing different plays. In 1925 Paul Fix appeared in his first motion picture "The Perfect Clown". He had the non screen credited role of a "Bellhop". 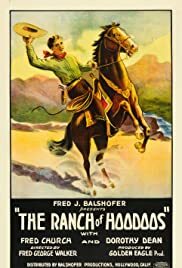 This was followed by his first Western "Hoodoo Ranch" aka: "The Ranch of Hoodoos" released January 22, 1926. All we know is that Paul Fix was part of a cast of six actors and one of them Jay Wilsey, an early Cowboy film star, portrayed "Buffalo Bill, Jr.". Paul Fix followed his first Western with fifth billing as "Ezra Talbot" in 1928's "The First Kiss" starring Fay Wray and Gary Cooper. 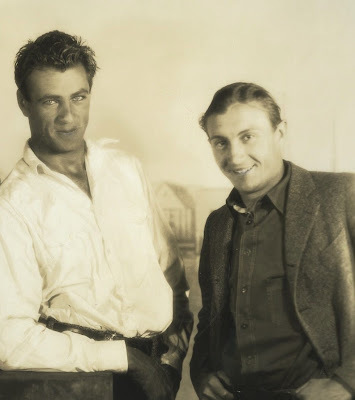 Above Gary Cooper and Paul Fix in a publicity shot for "The First Kiss". Next the young actor received fourth billing as "Joe" in 1929's "Lucky Star" starring Janet Gaynor and Charles Farrell. Four pictures later and Fix appeared in "B" Cowboy actor Buck Jones' "The Avenger". As my reader will discover the "The Avenger" was the first of several films with the Cowboy Actor, Paul Fix, would appear in varying size roles. In this Hollywood fiction of "The Avenger" Jones portrayed Mexican bandit "Joaquin Murietta" and Paul was his brother "Juan". Two motion pictures later came the start of a life long friendship. Fix was playing the non screen credited role of "Tony Halcomb" in a picture starring Loretta Young. Young had discovered that Paul had good acting instincts after the start of filming. This occurred after he suggested to the actress, with her permission, some changes to the way she was portraying her role. The film was 1931's "Three Girls Lost". Loretta had felt that her male lead seemed stiff in his role of "Gordon Wales", but the actress knew he had talent. At which point Loretta Young suggested to Paul Fix that he become an Acting Coach and work with the young actor named John Wayne. Above Loretta Young and John Wayne in "Three Girls Lost". In his very enjoyable memoir "Company of Heroes: My Life as an Actor in the John Ford Stock Company". Harry Carey, Jr. relates one extremely important event in John Wayne's life as a result of Loretta Young convincing Paul Fix to become his acting coach. According to Harry Carey, Jr. eventually Fix become part of a drinking crowd with Wayne, director John Ford and Harry Carey, Sr. Ford and Carey were discussing the upcoming 1939 production of "Stagecoach" and to them a major problem posed by John Wayne's acting. Even though he had been in over 30 "B" Westerns by this time. The actor looked like a "Hollywood Cowboy", but not a real cowboy. For "Stagecoach" John Ford needed the young actor to look, but more importantly "Feel" like both a cowboy and an escaped outlaw with a past. They gave the problem to Fix to "Fix". Paul's "Fix" turned out to be simple. He taught John Wayne how to walk and how to stand. As with Loretta Young, eight years earlier, Paul believed if you had the mannerisms of the role. Then no matter what you were dressed in, or what lines you recited. The audience would believe you were that character. That walk became second nature to John Wayne and recognized around the world as his trade mark. In 1944 Harry Carey, Jr. would marry Paul and Frances Fix's daughter Marilyn. They would remain married through his death in 2012. Returning to "Three Girls Lost" the picture would be immediately followed by another Buck Jones Western. Four other forgotten pictures followed and then came a Hal Roach "Little Rascals" comedy "Free Eats" released February 13, 1932. I looked all over for a still of Paul Fix in this short subject, because his role is described as "Elvira, 'wife' of the head of a gang of thieves". March 5, 1932 saw the actor in his third Buck Jones "B" Western "South of the Rio Grande" once again portraying a Mexican bandit named "Juan Olivarez". On April 9, 1932 Howard Hughes released the original "Scarface" directed by Howard Hawks. Look closely in some of the scenes with Boris Karloff as "Tom Gaffney". In them you might notice Paul Fix as a hood working for Karloff. On August 17, 1932 Paul was "Eddie Warner, Cell 8" in the original version of "The Last Mile" starring Preston Foster. December 30, 1932 saw actress Irene Dunne starring in "Back Street". In the film Paul Fix portrayed "Hugo Hack", but all his scenes were deleted prior to the film's release. 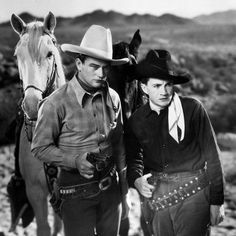 On May 27, 1933 for the first time Paul Fix was in a motion picture with John Wayne. 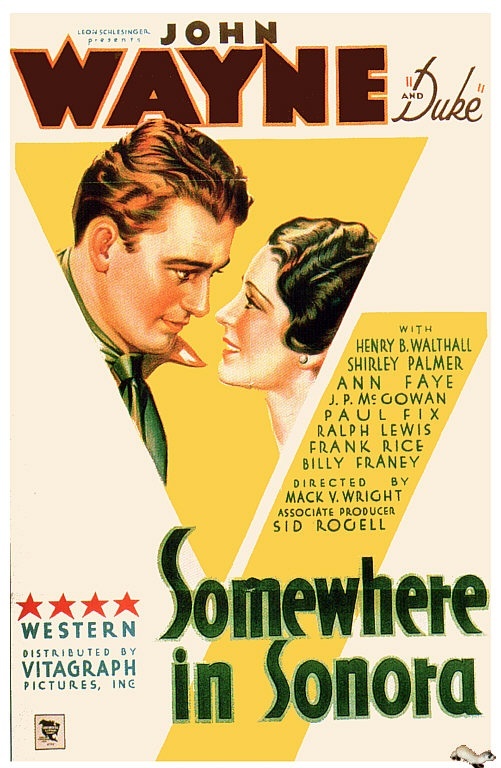 The title was "Somewhere in Sonora" and there are two interesting facts about this Warner Brothers release. The first is that the picture was one of six remakes of a series of 1927 Silent Westerns starring Ken Maynard. In the original movie Maynard was "Bob Bishop". In this picture John Wayne is "John Bishop". In the above photo Paul is "Bart Leadly" and that same named role in the original was portrayed by Carl Stockdale. To save money Warner Brothers dressed Wayne in exact outfits that Maynard wore and matched footage of Ken Maynard to John Wayne in the remakes. Hell, they named the Horse Duke! Speaking of Ken Maynard. After five more films including the kidnap drama "The Mad Game" starring Spencer Tracy and Claire Trevor. On November 20, 1933 Paul Fix was forth billed playing Maynard's brother "Mort Clark" in the Western "Fargo Express". Among Fix's next nine movie appearances were two more Buck Jones Westerns, a Western with Colonel Tim McCoy and playing a French Citizen in a crowd scene in the 1934 classic "Count of Monte Cristo". On April 22, 1935 Paul Fix once again appeared in a John Wayne "B" Western "The Desert Trail" as "Jim Whitmore". He's one of two men that murder a man and then rob the Rattlesnake Gulch rodeo. Next the two blame Wayne and his gambler friend. Fix is on the far right below. Paul Fix continued to play either a Gangster, or a Cowboy Villain in roles of different sizes. Another 1935 Western was "His Fighting Blood" starring Ken Maynard's older brother Kermit. Also in this busy year saw the actor featured in movies starring Buck Jones and Colonel Tim McCoy. Along with two Westerns starring William Boyd as "Hopalong Cassidy". On February 28, 1936 Paul Fix was part of the ensemble cast in John Ford's classic true story of "Dr/ Samuel Mudd". "Mudd" made the mistake of treating the injured John Wilkes Booth after he had assassinated Abraham Lincoln and became "The Prisoner of Shark Island". 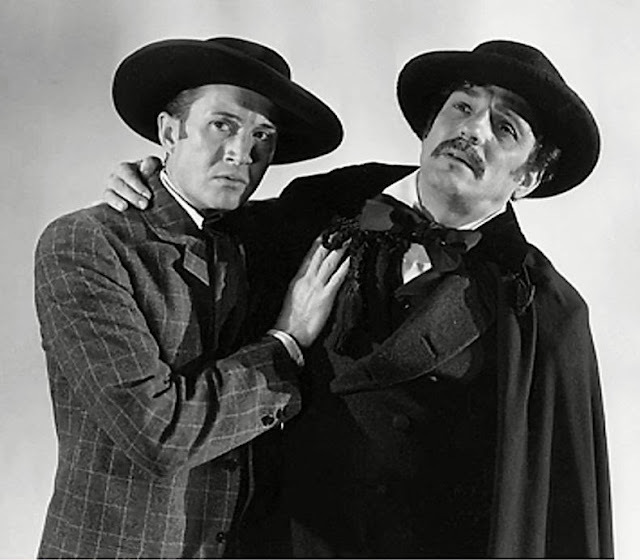 Below a publicity still of Paul as "David Herold" and star Warner Baxter as "Samuel Mudd". It was back to Cowboy villains, which Paul Fix was great aT, and Gangsters. Fix appeared in the Peter Lorre vehicle, April 7, 1938, "Mr. Moto's Gamble" in the role of "A Gangster".and "The Saint in New York" starring Louis Hayward as "Simon Templar", June 3, 1938, in the role of "Phil Farrell, a doorman at the Silver Club". Paul Fix had the colorful name of "Nails Miller" in the "King of Alcatraz", released September 30, 1938. What makes this 68 minute motion picture interesting is certainly not the plot, but who else was with Paul in the cast. That cast included Harry Carey, Lloyd Nolan, J, Carrol Naish, Robert Preston, Anthony Quinn, Richard Denning, Dennis Morgan, Monte Blue, John Hart and Tom Tyler. 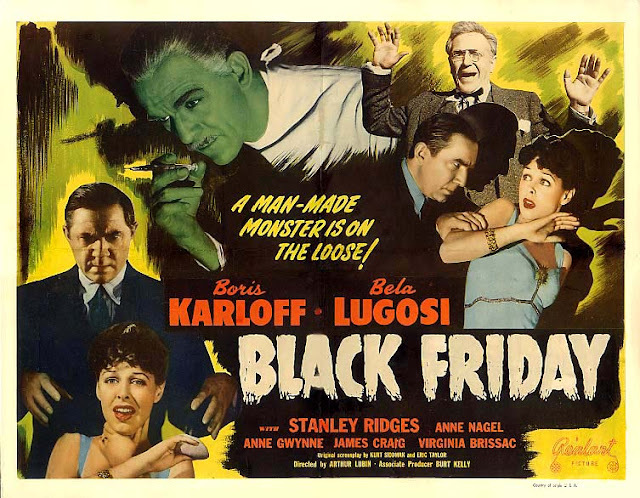 Through 1939 Paul Fix appeared in another 17 motion pictures and then in a Boris Karloff and Bela Lugosi Horror film "Black Friday" released on a Thursday in a leap year February 29, 1940. Paul was "William Kane", but of course eighth billing doesn't make the poster and to be truthful Bela had a part almost as small as Fix's. The difference being his name brought in his fans. On April 12, 1940 a sometimes overlooked Science Fiction/Horror film "Dr. Cyclops" opened in Technicolor from Paramount Pictures. 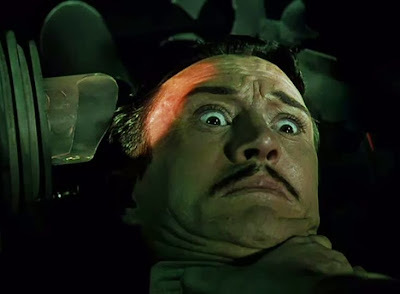 Paul Fix's "Dr. Mendoza" is killed off at the movies opening by Albert Dekker's "Dr. Thorkel". Who once his needed glasses are broken becomes the title character. "Torkel" has developed a machine that shrinks peoples and other living creatures. The effects were ground breaking and Fix, like the movie, is usually overlooked. The Mystery Picture of the Year! Besides playing Cowboys and Gangsters over the next year. Paul Fix got to do a little comedy, still playing a Gangster, in both 1940's "The Ghost Breakers" starring Bob Hope and Paulette Goddard and the similar 1941 "Hold that Ghost", but this time starring Bud Abbott and Lou Costello. Below Paul as "Frenchy Duval" in "The Ghost Breakers". 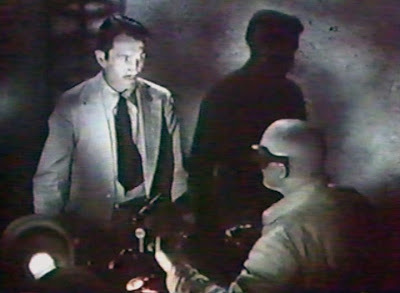 The following still is of very bad quality, but Paul Fix shows clearly as "Joe 'the Book' Conway" wearing the glasses. In a typical propaganda movie made after the United States entered World War 2. In this case the film takes place in 1939. When a team of convicts, under Ward Bond's "Steve Maschek", are sent into Germany to "Bring Hitler to Justice". The title of the film was "Hitler--Dead or Alive", released November 12, 1942, and was based on an actual event. From time to time I will mention other film appearances, but starting at this point I will be concentrating on the many performances Paul Fix had with his good friend John Wayne and will start with my mother's hometown of "Pittsburgh", released December 11, 1942. 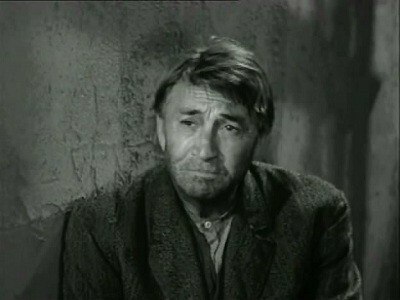 Paul Fix portrayed "Burnside, the Mine Owner" in this film The motion picture starred Marlene Dietrich, Randolph Scott and third billed John Wayne. It told the story of a man, Wayne, who valued wealth over his friends until his fortunes turn. Fix followed "Pittsburgh" with small roles in "Sherlock Holmes and the Secret Weapon", "Bombardier" and a cult Horror film"Captive Wild Women". In which John Carradine turns a Gorilla into a women. Released on December 6, 1943 was "In Old Oklahoma" aka. at its 1947 reissue. as "War of the Wildcats" starring John Wayne, Martha Scott and Albert Dekker. Itwas about a school teacher becoming the love interest between two men fighting for the oil rights on an Indian Reservation. Paul Fix had the interesting character name of "The Cherokee Kid". 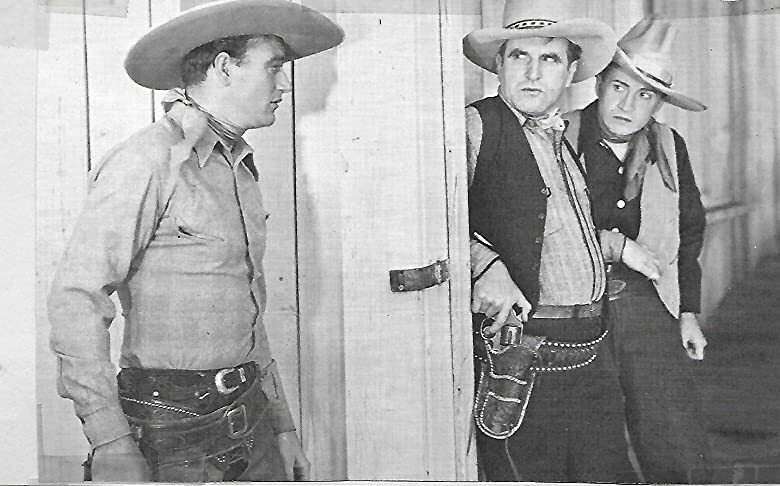 He's shown pointing his pistol at Wayne in this publicity still. 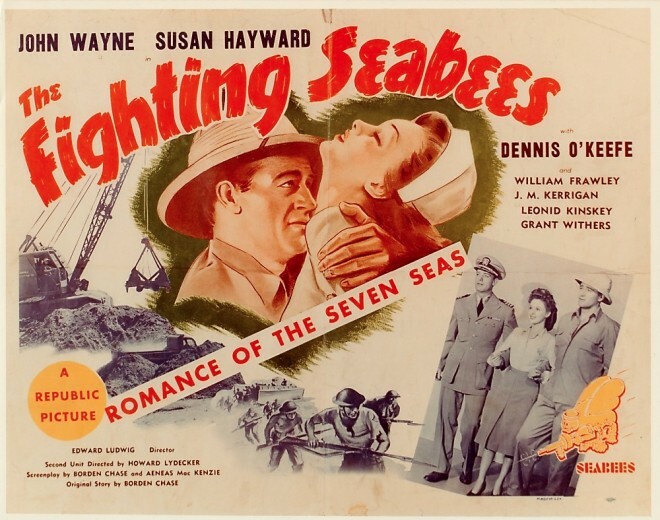 "The Fighting Seabees" , January 27, 1944, immediately followed "In Old California" for both Paul Fix and John Wayne. This highly fictionalized story of the creation of the Navy Seabees featured a young Susan Hayward and Dennis O'Keefe. Paul's character was named "Ding Jacobs". On Sepetember 29, 1944 the Western "Tall in the Saddle" followed "The Fighting Seabees". Not only did Paul Fix appear in this John Wayne film, but he wrote the screenplay. The story is about a cowhand who arrives in a town to find his new employee murdered. Wayne's USC Football friend Ward Bond portrayed the villain of the story and actress Ella Raines the love interest. Fix's own character was "Bob Clews". He is on the left of the following still with Wayne, George "Gabby" Hayes and Raymond Hatton. A one movie break from being in John Wayne features happened with "Grissly's Millions" in January 1945, but after that film. Paul Fix was back with "The Duke" in "Flame of Barbary Coast". Actress Ann Dvorak was the "Flame" of the film's title as "Ann 'Flaxen' Tarry". Fix had another colorful character name as "Calico Jim". Who is seen on the far left of the following still. It seemed that Paul Fix appearing in John Wayne pictures was becoming a normal thing. In fact his next five features were Wayne titles. Beginning with portraying "Bindle Jackson" in the May 31, 1945 release of the World War 2 flag waver "Back to Bataan". Below Paul is second from left. 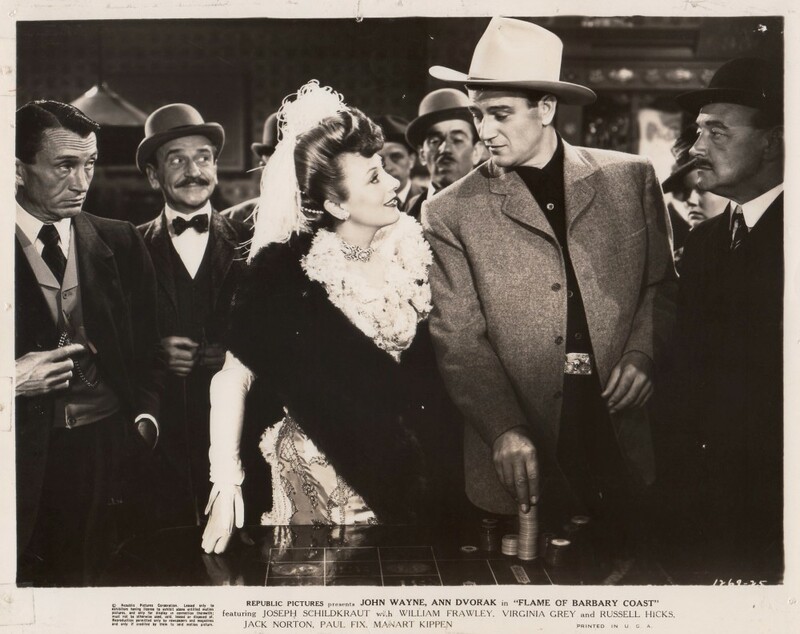 The Western "Dakota" was released by Republic Pictures on December 25, 1945 and Wayne's co-star was Vera Ralston. Ralston, according to the critics without talent, just happened to be the wife of the owner of Republic Pictures Herbert J, Yates and that might have led to her being cast. I write with tongue firmly in cheek. Paul Fix had another villainous role as "Carp". Paul's next film didn't give the actor any on screen credit as "Mouse Marr", but was also a Wayne feature/ "Angel and the Badman" released on February 15, 1947. The plot had outlaw "Quirt Evans", John Wayne, mend his ways under the charms of the Quaker girl "Penelope Worth" portrayed by co-star Gail Russell. In 1945 Paul divorced Francis. In 1949 he would marry Beverley Pratt and the two would remain married through he death in 1979. They had no children. "Tycoon", December 27, 1947, tells the story of "Johnny Munroe", Wayne, and his team sent to South America to build a tunnel through a mountain for a railroad owner played by Sir Cedric Hardwicke. 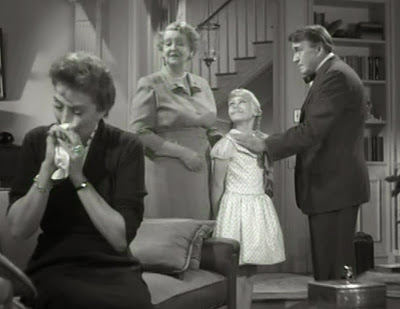 "Munroe" will of course fall in love with the daughter, "Maura", played by co-star Laraine Day. Above Paul Fix is seen on the far right as "Joe". The picture also featured the future "Dame" Judith Anderson, Anthony Quinn and James Gleason. Originally Maureen O'Hara was to have co-starred in the motion picture, but RKO switched her to "Sinbad the Sailor" starring Douglas Fairbanks, Jr. Had O'Hara stayed with "Tycoon". This would have been her first pairing with Wayne. Instead that awaited until 1950 and "Rio Grande". In between John Wayne Westerns was a Republic Picture's "B" Western starring John Carroll and Adele Mara called "Angel in Exile". Paul was seen as "Carl Spitz". The story has an ex-convict dreaming of making his fortune in gold in the Arizona Territory, but being mistaken by a Mexican village as a sacred religious figure come to life. There are Westerns and then there are WESTERNS. A Western released on September 30, 1948 saw Paul Fix portray the Wrangler "Teeler Yacey". Harry Carey was "Mr Melville the Representative of the Greenwood Trading Company", his son Harry Carey, Jr. was Wrangler "Dan Latimer", Noah Berry, Jr. Wrangler "Buster McGee". Without on screen credit were actress Shelley Winters as a "Dance Hall Girl" and two more Wrangler's portrayed by Tom Tyler, "Luke Plummer in John Ford's Stagecoach", and Glenn Strange, best remembered as the last Universal "Frankenstein Monster". Moving up in this splendid cast was John Ireland as "Cherry Valance". Two years before this film Ireland had portrayed "Ringo" in John Ford's "My Darling Clementine". The year following this role. Ireland would play "Robert Ford" in Sam Fuller's "I Shot Jesse James". The second leading actress was Colleen Gray as "Fen", but. unfortunately she's best remembered in the title role of the 1960 movie "The Leech Woman". The leading actress in the picture was Joanne Dru as "Tess Millay". The following year Dru was in John Ford's "She Wore A Yellow Ribbon".. While the third male lead in this motion picture was Walter Brennan playing "Nadine Groot". I would expect my reader to already know the picture I refer too. 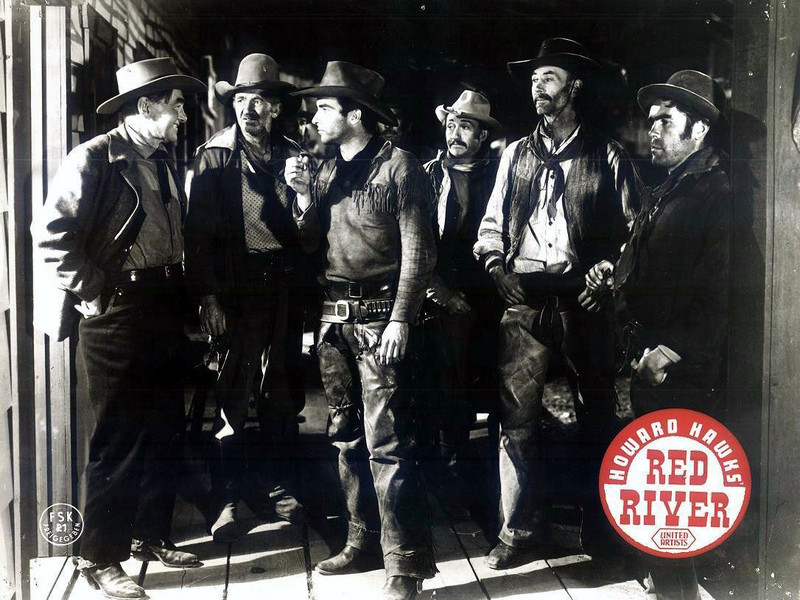 This was producer/director Howard Hawks' "Red River". The film that convinced John Ford to cast John Wayne in the previously mentioned "She Wore A Yellow Ribbon". After he saw him as "Thomas Dunson". Wayne's co-star in only his second motion picture was Montgomery Clift as "Matthew 'Matt' Garth". Below second from the left is Walter Brennan, Montgomery Clift is next to him and Paul Fix next to Clift. Three more forgotten motion pictures and Pail Fix was back with John Wayne and Gail Russell in the "Wake of the Red Witch", released March 1, 1949. Wayne is a sea captain out for revenge against a wealthy ship company owner. His "Captain Rails" is a cruel master of the "Red Witch" and for personal reasons he deliberately scuttles her with a cargo of gold bullion in the hold. Why and the recovery of the gold make up the features plot. Paul Fix portrays a seaman called "Antonio 'Ripper' Arrezo". 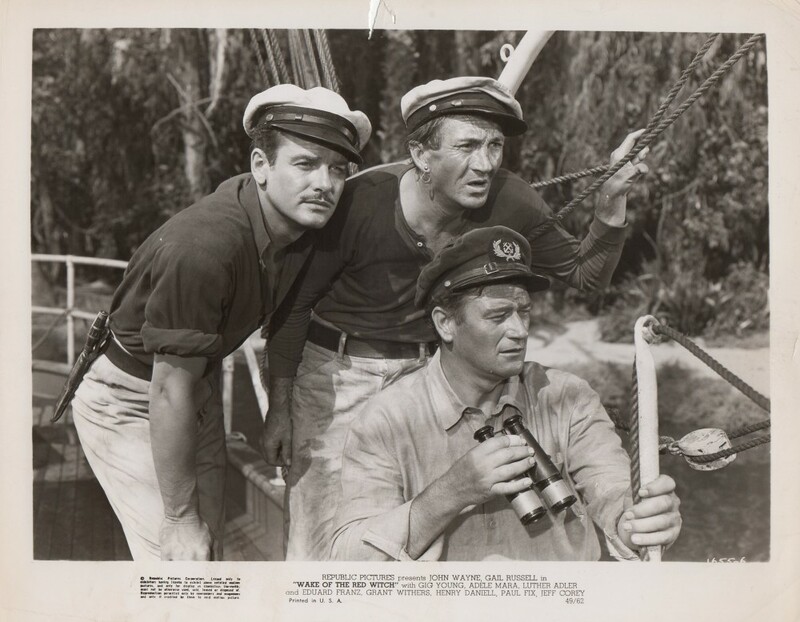 Below Gig Young as "Samuel 'Sam' Rosen", Fix and Wayne. 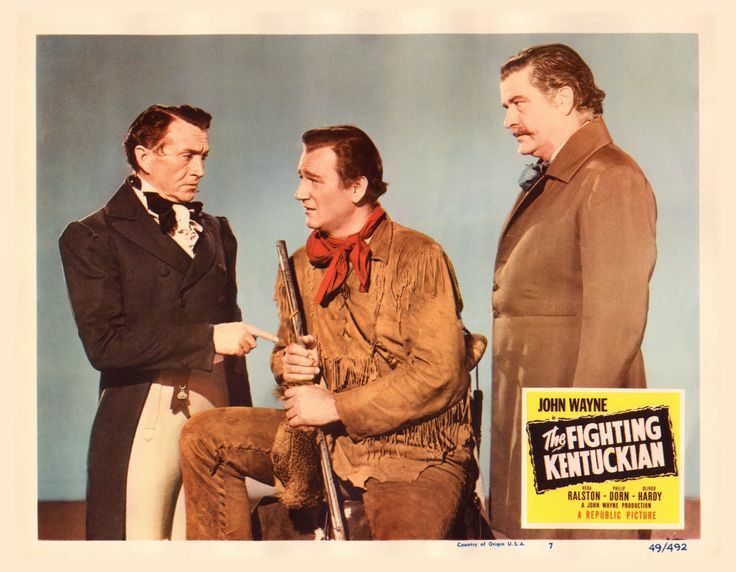 Set in 1818 Alabama was "The Fighting Kentuckian" released on September 15, 1949. The plot is about French Immigrant Settlers being harassed by land grabber "Blake Randolph" played by John Howard. Paul Fix portrayed "Beau Merrit" who works for "Randolph". In the lobby card below you have Fix, Wayne and Grant Withers as "George Hayden". Following Paul's next Western movie the "Fighting Man of the Plains" starring Randolph Scott on November 16, 1949. He made his first appearance in the new medium of television. Fix's role was an old west con man named "Silk" who was "Salting" a mine to sucker investors into buying shares. The program aired September 24, 1950 with the title "The Million Dollar Wall Paper" and "Silk" was stopped by "The Lone Ranger" and his faithful Indian companion "Tonto". September 15, 1950 Republic Picture's released "Surrender". It's basically a typical "B" Western set in Texas involving a falsely accused man for murder. 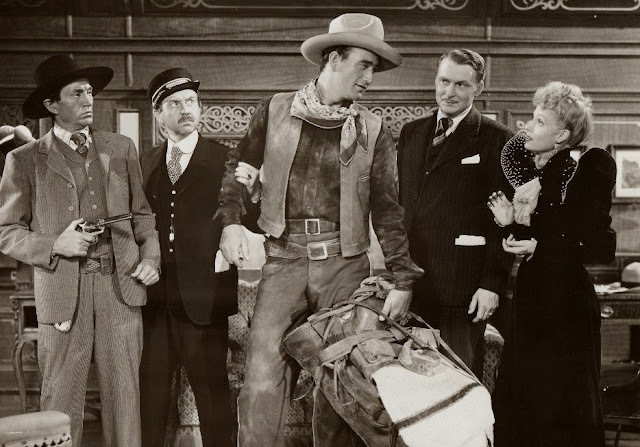 Paul Fix's "Deputy Williams" is easily seen on the extreme left next to Walter Brennan. Brennan's "Sheriff Bill Howard" is lecturing saloon owner "Gregg Delaney" portrayed by the movies male lead John Carroll. What makes this film interesting are three other names in the cast. Portraying "Molly Hale" was Jane Darrow. Darrow had won the Best Supporting Actress Academy Award for playing "Ma Joad" in John Ford's 1940 film "The Grapes of Wrath" and appeared in William A. Wellman's 1943 production of "The Ox-Bow Incident". The third actor I want to mention was in the role of "Canning" and was Jeff York. This was five years before he first appeared as "Mike Fink" in Walt Disney's "Davy Crockett and the Keel Boar Race". York had been in motion pictures since 1937. There were eleven more performances for Paul Fix until the motion picture "A Fair Wind to Java". Those appearances included one episode of the popular gangster television series "Racket Squad" playing his stereo typed "Hood". Which he also had fun with in a comic episode of "The Abbott and Costello" television show. Along with six "B" Western titles, a World War One film starring James Gagney and "Big Jim McLain" released August 30, 1952. That pro-House Committee on Un-American Activities film starred John Wayne and James Arness as that committee's agents. Paul Fix's role was that of a voice, the actor never seen on screen, named "Chauncey". Released March 30, 1953 "A Fair Wind to Java" starred Fred MacMurray and Vera Ralston. This was the first motion picture using the volcanic disaster of the eruption of Krakatoa, in 1883, as a back drop. Paul Fix played one of MacMurray's crew named "Wilson". On August 15, 1953 Paul Fix played a guard with a Gatling Gun in the first of two 3-D movies he would be seen in. 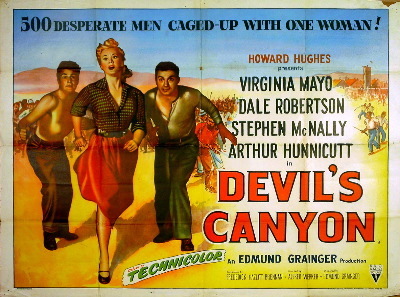 This was Howard Hughes production "Devil's Canyon" starring Virginia Mayo and Dale Robertson. After that very small role in a film with the typical Howard Hughes tag line of "500 Desperate Men Caged Up With One Women" the actor was back with John Wayne for two motion pictures. Author Ernest K. Gann wrote two popular novels that he turned both into extremely popular screenplays directed by William "Wild Bill" Wellman. 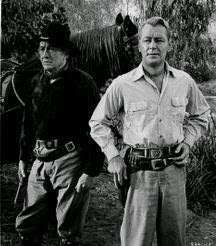 Both film versions also starred John Wayne and featured Paul Fix. The first was released on September 3, 1953 and was based upon a rescue mission Army pilot Gann actually participated in. The film was "Island in the Sky". John Wayne's Army C-47 crashes in what was then the waste land of Canada and a rescue mission is started. Paul Fix was "Wally Miller" one of the pilots in rotation looking for the down aircraft. In the above still Fix is leaning on the far left. In this still are some recognizable faces in the ensemble case. 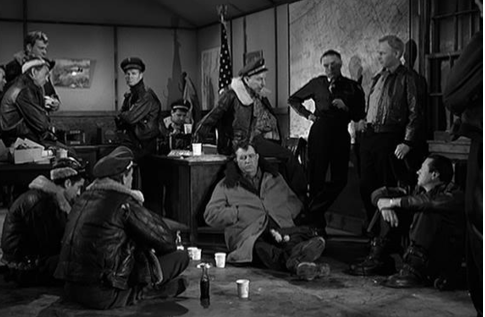 Standing by Fix is James Arness, on the floor is Andy Devine, behind him is Lloyd Nolan, Against the map is Paul Abel and next to him is Harry Carey. Jr. Also in the cast were Sean McClory. Regis Toomey, Bob Steele, Darryl Hickman, Mike "Touch" Connors and Carl 'Alfalfa" Switzer. That second 3-D motion picture followed and was released on November 27, 1953. 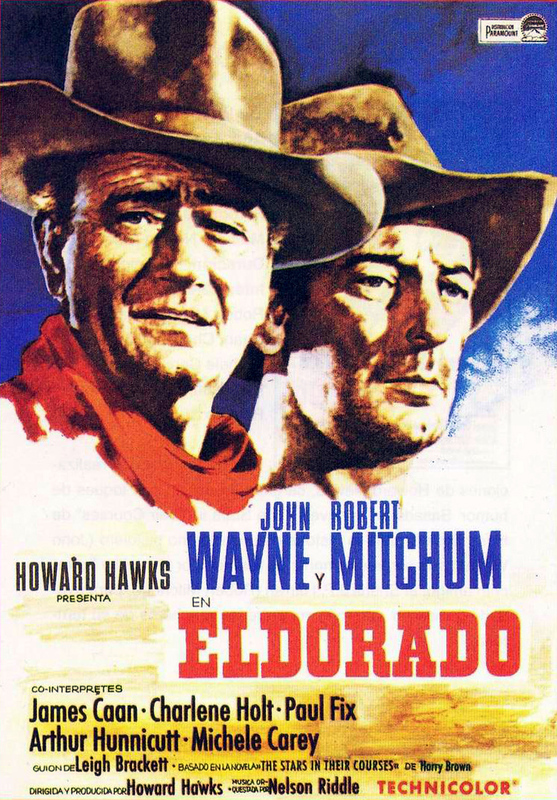 This feature also starred John Wayne in the title role as Louis L'Amour's "Hondo". Paul Fix portrayed "Army Major Sherry". Paul Fix returned to his trademark Gangster roles as two different characters in two different episodes of television's "The Adventures of Superman" starring George Reeves. In the episode "Semi-Private Eye" January 16, 1954 the actor was billed as "Peter" Fix. On May 7, 1954 the very interesting character study Western by director Nicholas Ray, "Rebel Without A Cause" and "55 Days At Peking", premiered. "Johnny Guitar" had an interesting cast including Joan Crawford, Mercedes McCambridge, Sterling Hayden, Scott Brady, Ward Bond, Ernest Borgnine, John Carradine and Paul Fix as Crawford's dealer :Eddie". Paul Fix next appeared in the second motion picture based upon an Ernest K. Gann novel. "The High and the Mighty" was actually a surprise major Oscar nominated feature. It is also the first airplane disaster motion picture with a an "All Star Cast", if only considered "B" stars. John Wayne portrayed "First Officer Dan Roman", Robert Stack was pilot "Captain John Sullivan", Paul Fix was "Frank Briscoe", Dueling Supporting Actress Oscar nominees were Jan Sterling as "Sally McGee" and Claire Trevor, "Dallas in John Ford's 'Stagecoach", was "May Hoist". Jan Sterling had already received the Golden Globe for her role. William Wellman was nominated for Best Director. 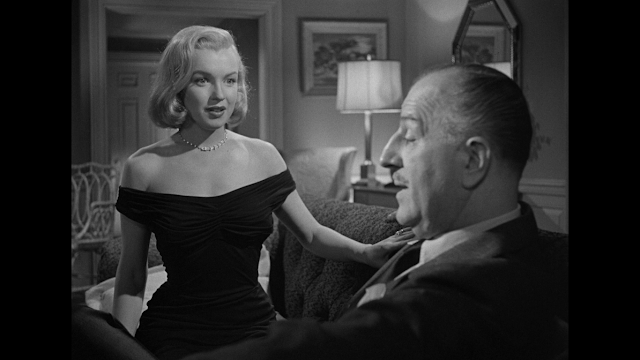 The picture was nominated for six Oscar and won only Best Original Score for Dimitri Tiomkin. The story used flashbacks to tell everyone on board the airplane's backstory. In the case of Fix's "Frank Briscoe" he is a dying man reviewing his life and giving strength to Jan Sterling's "Sally McGee". Two more television shows and on June 4, 1955 Paul Fix was once more in a movie with his friend John Wayne. 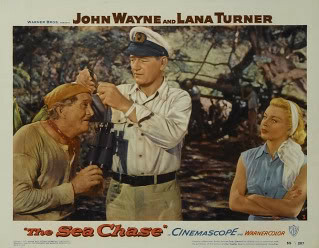 The picture was "The Sea Chase" and a British/American co-production. This was also one of four films the "Duke" used in an attempt to change his Cowboy image. Wayne is the Captain of a German Merchant Ship just after Germany had invaded Poland and World War 2 is about to start. The story has the merchant being chased by British and Australian ships to capture it's crew. After the one Nazi on board, :"Chief Officer Kirchner", played by Lyle Bettger, murders civilians on Auckland Island against the Captain's orders. Above Fix, Wayne and Lana Turner. For my ninth birthday, in October 1955, I went to see Paul Fix playing Chinese patriarch, "Mr. Tao", in director William Wellman's "Blood Alley". Which I confess remains my favorite all time John Wayne film with co-star was Lauren Bacall. She reminded in the role even after her husband, Humphrey Bogart, decided not to play what became Wayne's role. This film was unflinchingly anti-Chinese Communist, but unlike "Big Jim McLain" very exciting. Below's the "Duke" has just been smuggled out of a Chinese jail and meets "Mr. Tao" and "Cathy Granger", Bacall. Like normal Hollywood procedures the leading Oriental roles where played by Caucasian actors."Mr. 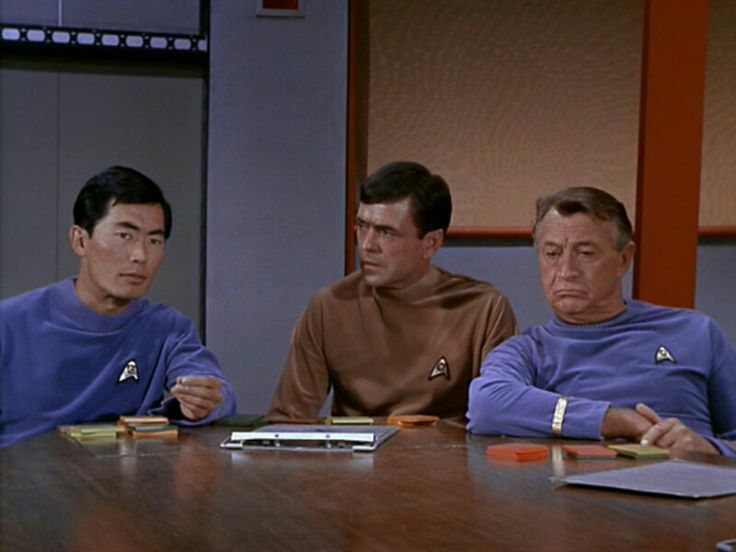 Tao" reveals that Wayne's "Captain Tom Wilder" was rescued to Captain an old Ferryboat. For the purpose of to taking "Tao's" entire village, their dead ancestors and livestock to safety in Hong Kong down the Chinese patrolled river known as "Blood Alley". As I said Wellman spins an exciting adventure. Fix had third billing. Paul was now dividing his time between television and motion pictures on a regular basis. As the still young medium was keeping families at home to watch such shows as "The Ford Television Theater" presented by the Ford Motor Company. Fix was in two television productions after making "Blood Alley" with one on the Ford program. He was also seen in the Alan Ladd motion picture "Santiago". Then there was the 1956 motion picture with a no one admitted under 16 years of age, because its subject matter was about a nine year old murderess "The Bad Seed". Even Patty McCormick who had portrayed the role of "Rhoda" on Broadway for over 300 performances and in the motion picture version. Wasn't permitted to see the movie and she eventually saw it on television when she was now 21 years of age. On October 26, 1956 Paul Fix was "Lieutenant General Bryan Shellby" in Melvyn Leroy's "Toward the Unknown" starring William Holden as Air Force Test Pilot "Major Lincoln Bond". On November 24, 1956 Paul Fix portrayed "Dr. Horace Lynnton" the father of Elizabeth Taylor's "Leslie Lynnton". The picture was director George Stevens production of Edna Ferber's ":Giant". Also starring Rock Hudson and James Dean. 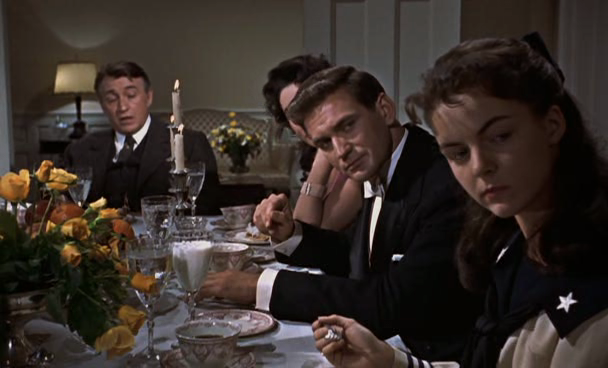 Below Paul Fix at the far end of the table and then unknown Australian actor Rod Taylor as "Sir David Karfey" and billed as Rodney Taylor. Seven roles later, four on television and three in forgotten motion pictures, found Paul Fix in another John Wayne vehicle from producer Howard Hughes. "Jet Pilot" was released on September 25, 1957, but had been made in 1950, sat on the "Shelves" as they say and appeared extremely "Dated". Example the scene were Soviet Defector, or Spy "Lt Anna Marladovna", portrayed by Janet Leigh, trays on Swimsuits in Palm Springs. The look of those suits confirmed the year the picture had been made. This film was planned to be another Howard Hughes' "Hell's Angels", but set during the Cold War. "Hell's Angels" had been set during World War One and made a star out of Jean Harlow. However, there were too many comic elements to the film planned and not planned. Again supposedly to make fun of the Soviet Union that just didn't work. Paul Fix portrayed "Major Rexford". On February 28, 1958 Paul Fix wrote the original story, the screenplay and starred as "The Notorious Mr. Monks". For those wondering what "Naturama" was? Apparently it was a low budget Widescreen process used by Republic Studios to compete with CinemaScope. The film's plot is described as a drunken driver, Paul Fix, his wife, Vera Ralston, and a hitchhiker, Don Kelly, equal murder. Not on the same bill, but released also on February 28, 1958. Found Paul Fix in a William Wellman production, without John Wayne, that was based upon the director's life as an American pilot for the French during World War One. "Lafayette Escadrille" told the story of several Americans, some by actual names that Wellman knew, who join the famed flying squadron. Wellman was in another unit during the war. The picture starred Tab Hunter and featured little known actors Clint Eastwood, David Janssen, Will Hutchins, Bret Halsey, Tom Laughlin, Jody McCrea and William Wellman, Jr. as his father. Paul Fix portrayed an American General. While on September 30, 1958 Paul Fix made his first appearance on the television series "The Rifleman", but not as "Marshall Micah Torrance". Instead he had a non screen credited role as a doctor in the very first episode of the series, created by Sam Pechinpah, entitled "The Sharpshooter". Fix returned one month later, October 21, 1958, for Episode Four of that first season in "The Marshall". Fix was the down drunk "Micah Torrance" who becomes the Sheriff at the episodes conclusion. Paul Fix would remain in the role for an additional 149 episodes through April 8, 1963 in "Old Tony". Below Paul Fix as the alcoholic "Micah Torrance" and the new Town Marshall. 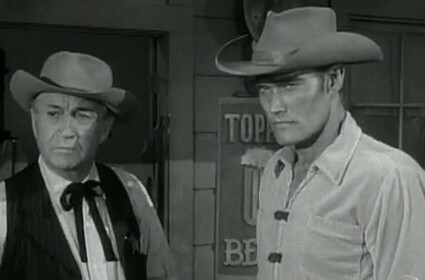 During the period of being on the "Rifleman" Paul Fix was also guest starring on many other television Westerns. Such as "Broken Arrow", "Lawman", "Rawhide", "River Boat", "The Zane Grey Theater" and "Laramie". On December 26, 1962 Paul Fix portrayed "Judge John Taylor". 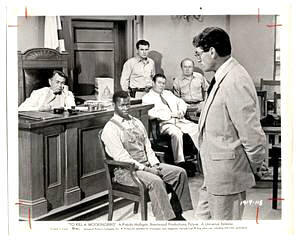 "Taylor"conducts the trial of ":Tom Robinson", Brock Peters, being defended by Gregory Peck's "Atticus Finch" in "To Kill A Mockingbird". October 8,1964 saw Paul Fix in an interesting motion picture from director Martin Ritt. Most people know that 1960's "The Magnificent Seven" was director John Sturges' Americanization of Akira Kurosawa's "The Seven Samurai". Director Martin Ritt did an Americanization of another classic Kurosawa feature "Rashomon". 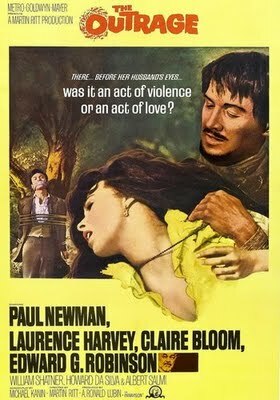 The picture was called "The Outrage" and starred Paul Newman, Lawrence Harvey, Claire Bloom and Edgar G. Robinson. On the above poster is Paul Newman as a Mexican bandit. 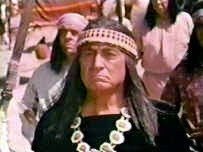 In the film under heave make-up Paul Fix was the "Indian". 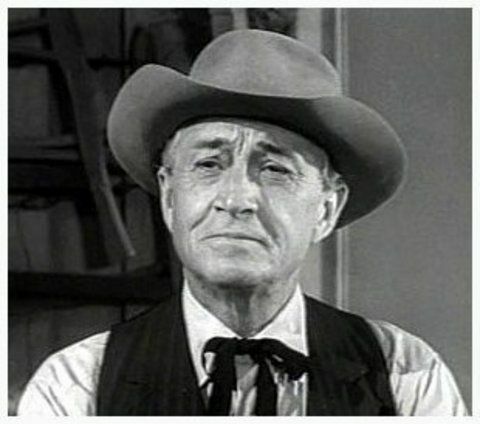 Between 1959 and 1965 Paul Fix was seen in guest roles on "Wagon Train","The Fugitive", "Bob Hope Presents the Chrysler Theater" and even "Lassie". He also appeared in the 1965 Steven McQueen and Lee Remick feature "Baby the Rain Must Fall". Specifically on June 3, 1965 Paul was seen as "Dr. Tom Witherspoon" in the James Stewart Civil War picture "Shenandoah". 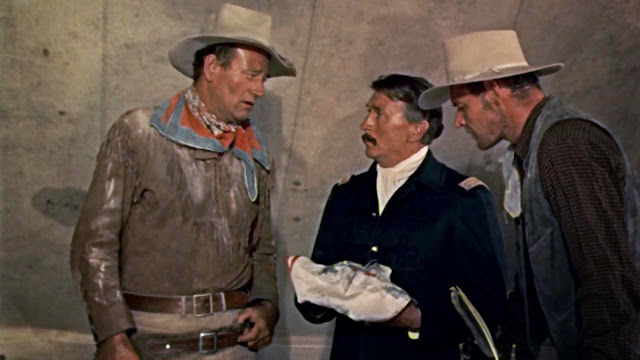 Below, and first seen on August 16, 1965, Paul Fix as "Sheriff Billy Wilson" faces off with John Wayne and Dean Martin. Earl Holliman and Michael Anderson, Jr portrayed their brothers as "The Sons of Katie Elder" directed by Henry Hathaway. Author Harold Robbins had written a 1961 novel called "The Carpetbaggers". Which became a Best Seller not so disguised look at the life of Howard Hughes now called "Jonas Cord". You have his affair with Jean Harlow in the novel and a whole section about a good friend of "Cord's" named "Nevada Smith". The novel was made into a highly successful motion picture in 1964 starring George Peppard as "Cord" and Alan Ladd as an older "Nevada Smith". Which brings me to a great Western, directed by Henry Hathaway, made out of the section of Robbin's novel on the early life of "Nevada Smith". The movie was released under that title on June 10, 1966 starring Steve McQueen as the young "Smith". The picture follows the character's life as he tracks down the murderers of his Native American mother. Brian Keith played a gun salesman who teaches McQueen how to shoot. The name of Keith's character was "Jonas Cord Senior". As with all the main characters in Robbins "Novel the" "Nevada Smith" was based upon a real person. In this case William Boyd. Boyd who became a "B" Cowboy star as "Hopalong Cassidy". Paul Fix portrayed the character of "Sheriff Bonnell" in the ensemble cast. Before there was "Dr. Leonard "Bones" McCoy" there was "Dr. Piper". The Third episode of the First Season of "Star Trek" was called "Where No Man Has Gone Before" and originally aired on September 22, 1966. Actually there were two doctors on "The Enterprise". The second was "Dr. Elizabeth Dehner" portrayed by Sally Kellerman four years before she created the character of "Major Margaret 'Hot Lips' O'Houlihan" in Robert Altman's motion picture "MASH". "Star Trek" was immediately followed up in 1966 by guest appearances on "Voyage to the Bottom of the Sea" and "The Time Tunnel". Next it was two more Western feature films. The first was "Welcome to Hard Times" starring Henry Fonda and the second was with John Wayne of course. Howard Hawks had always wanted to remake "Rio Bravo". On June 12, 1967 and not truly a remake, but a remix of elements of that 1959 classic "El Dorado" was released. Co-starring with John Wayne was Robert Mitchum and the picture featured a young actor named James Caan. 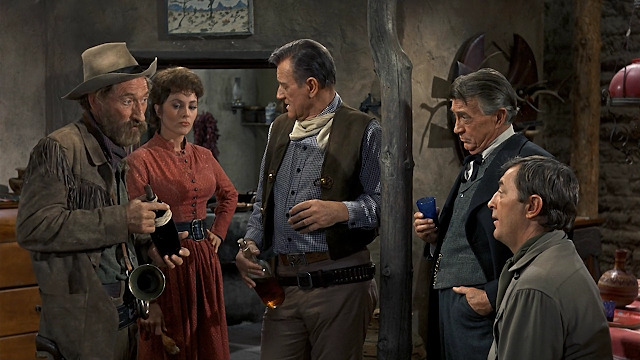 Above Arthur Hunnicutt (Remix of Walter Brennan's role), Carlene Holt (Remix of Angie Dickinson's Role), John Wayne, Paul Fix as "Dr, Miller" and Robert Mitchum (A Composite of John Wayne and Dean Martin's Roles). On the television series "Gunsmoke" Paul Fix appeared for his fifth and sixth times in a two part story entitled "Vengence" on October 2 and October 9, 1967. Fix was seen twice on the "Wild, Wild West" and on "The High Chaparral" viewers found the actor portraying the Apache Chief Cochise. Then there were "The Big Valley""The Guns of Will Sonnett" and "Daniel Boone", if it was a Western television series. My reader could be sure Paul Fix would turn up in some episode. Not forgetting he was twice on "Land of the Giants" and even once on the original "The Andy Griffith Show". During this time Paul also appeared in four different episodes of "Death Valley Days". You want to talk about a busy character actor and I haven't mentioned every role and show Paul appeared in during the 1950's and 1960's. In 1969 Paul Fix was reunited with Robert Mitchum and John Wayne, but in two separate motion pictures. Robert Mitchum on September 17, 1969 was "Deputy Ben Kane" in Burt Kennedy's Western "Young Billy Young". The underrated movie was bout a young outlaw, Robert Walker,Jr. who becomes the Deputy Sheriff under Mitchum. David Carradine portrayed "Billy's" outlaw buddy "Jesse Bone". Who stays bad until the story's end. Paul Fix plated "Charlie". On October 6, 1969 Paul Fix was back portraying an Indian on Lucille Ball's television show "Here's Lucy". Episode Three of Season Two was entitled "Lucy and the Indian Chief". Paul Fix was "General Joe Masters" in the John Wayne and Rock Hudson feature "The Undefeated". Which was released on November 27, 1968. From 1970 into 1973 Paul Fix appeared in a variety of television shows such as "Family Affair", "The Young Lawyers" and "Ironside". November 18, 1970 saw Paul once more as a Native American named "Chief Crazy Blanket" in the Frank Sinatra comedy Western "Dirty Dingus Magee". 1970 also saw Fix's last guest appearance on "The Virginian" which he had first appeared in 1964. Paul was another Native American in "Something Big". A Western starring Dean Martin and Brian Keith from director Andrew V. McLaglen. His role was that of "Chief Yellow Sun". Paul Fix followed "Something Big" by returning to television on programs such as "Mannix", "Alias Smith and Jones" and "The Doris Day Show". Director Sam Peckinpah wanted to do the story of William H. Bonney his way. A combination of reality and legend. The result was "Pat Garrett and Billy the Kid". Starring James Coburn as Garrett and a choice that surprised many critics singer Kris Kristofferson as Billy. Also in this cast of great character actors was another non actor Bob Dylan as one of the "Kid's Gang". Paul Fix returned to a small role with his friend John Wayne in "Cahill, U.S. Marshall" released two months after "Pat Garrett and Billy the Kid" on July 11, 1973. His role reflected upon the 76 year old actor, because the screenplay just called his character the "Old Man". 21 more roles followed this film and Paul Fix ended his career in an episode of the Jack Klugman television series "Quincy M.E." entitled "For Want of a Horse" on December 9, 1981. Before that final program there were three roles I want to mention. The first saw Paul once again as a Native American named "Running Wolf" in the excellent 1977 film "Grayeagle". 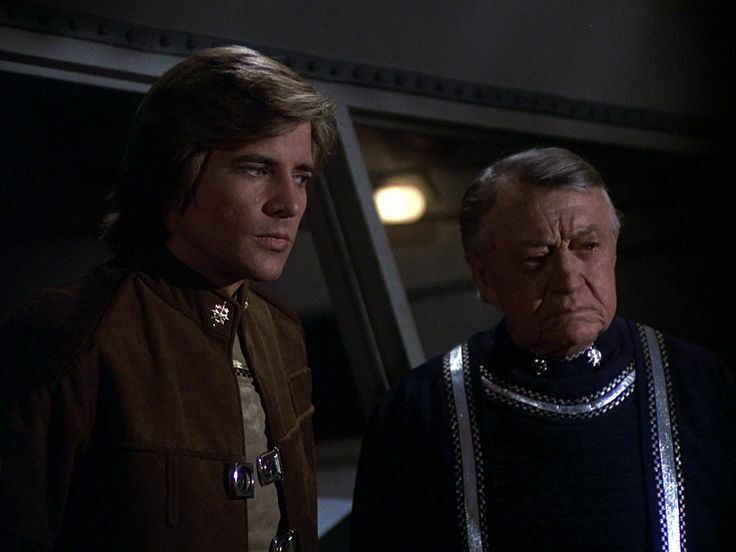 He had played "Commander Kronus" in Episode 20 in Season One of the original "Battlestar Galactica" entitled "Take the Celestra". The last motion picture to open with Paul Fix was directed by its star Peter Fonda and co-starred Brooke Shields as the title character of "Wanda Nevada". This mostly unknown little comedy gem is set not in Nevada as one might expect from the heroine's name, but Arizona. There's a cameo appearance by Peter's father, who was said to be out of work and actually needed money at the time, as an old Arizona Prospector. The film was released in June of 1979. Paul Fix had the colorful name of "Texas Curly".